Hosted at the Detroit Athletic Club in April of 2015, this panel of vehicle designers discusses ‘Mobility For All’. 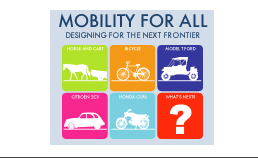 The topic coincides with the 2016 Michelin Challenge Design theme – Mobility For All – Designing for the Next Frontier. Panelists include: Alexander Klatt, College for Creative Studies; Jason Wilbur, Advanced Design Studio – Honda R&D; and Ben Ebel, Michelin Challenge Design. Moderated by Jason Stein, Editor & Publisher, Automotive News. >> | Mobility For All. Designing for the Next Frontier. 03 | Mobility for All. Global Development Issues. 09 | Where Do ‘New’ Ideas Come From?